One of the things I remember most about my childhood is making raspberry freezer jam with my mama! Mainly helping stir the mixture, but still...and eating some of the sugary berry chucks while stirring...yum! Earlier this week, I used up the last of my jam supply. So, obviously I had to make more. Luckily, it's a pretty quick and easy recipe, with little room for failure. You just have to make sure your Certo is not expired. I did that once, and the jam won't set...leaving you with syrup instead, which is still pretty dang delicious. Growing up, my mom would typically make raspberry jam and strawberry jam. I've never liked the strawberry jam. I don't care for the consistency or the texture of it. 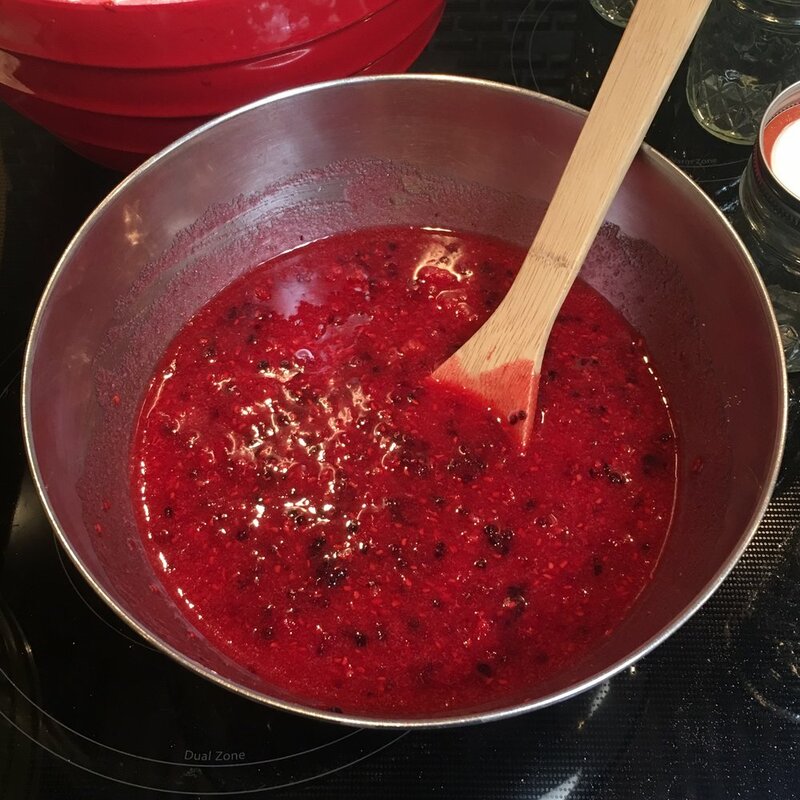 Lately, she has been using raspberries AND blackberries and, oh my goodness, it is delicious! I've been stocking up on both berries in my freezer and now it's time to use them! Medium to large mixing bowl, one with a spout makes things easier, if you have one. Liquid Certo tends to be cheaper at Walmart but it’s not always in store... Fry’s has some for about $5.50 a box. The instructions for all different flavors of freezer jam are on the paper insert inside the box of the liquid Certo. Some of them call for water, so make sure you double check the ingredients if you are making a different flavor of jam. Poor one pouch of liquid Certo into the berry mixture and add 2 Tbsps of lemon juice. Start the clock and stir for 3 minutes straight! Once the timer is up, poor the mixture into your jars, careful not to spill. Leave 1/2 in at the top for expansion in the freezer. Some jars have a faint line just under where the bottom of the lid will be. Wipe off any jam that got on the outside of the jar. You don't want to lid to get sealed closed. Let stand on the counter, room temperature, for 24 hours, or until set. Here, I made 4 batches and ended up with 4.5 8oz jars, 5 12oz jars and 6 16oz jars. One batch makes about 48oz, which should fill up 3 16oz jars perfectly or 6 8oz jars. If you have some 12oz jars, you may end up with half of a jar somewhere, so make sure you have some smaller jars (and some extra!) just in case. If you spill a lot, it might be less... Sometimes it's helpful to have a third hand to hold an awkward bowl, that way you have both of your hands to neatly guide the jam into the jar. And it helps to have a bowl with a spout and maybe even a handle. Once you have your delicious raspberry/blackberry jam, the next best thing to make are Raspberry Oatmeal Bars! But in this case, they would be Raspberry/Blackberry Oatmeal bars. They are seriously so delicious. I always have to double the batch, or else I'd eat the entire thing within the same day.